Adrian Morrow and Brian Wilson, Glenarm Estates chatting to members. Last week the 2015-16 winter programme for the Larne UFU Group concluded. The meetings were very well attended by members of all age groups which is very encouraging for the future of the group. The January meeting was conducted by UFU Policy Officer David Oliver who covered what is inspected in a NIEA inspection and insight into New Farm Improvement Grant. This was a very good meeting and well covered off by the new recruit to the UFU Policy team. The delivery of the presentation and indepth knowledge by David was very impressive and bodes well for a successful future with UFU HQ. In February the group welcomed back former UFU Membership Director Joe McDonald in his new role as NI Corporate Affairs Manager, ASDA. This was an extremely interesting meeting with Joe covering in depth the trading environment that a supermarket operates in with NI and wider GB. In a lively debate at times with members he gave a useful insight in to the commitment that ASDA have made to buying local produce. Those members who attended would certainly agree that the meeting changed their perceptions of the trading environment that a supermarket operates under, the price deals that ASDA have in place for local produce and all decisions are very much driven by market demand and research. 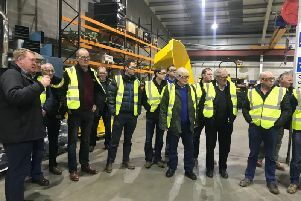 The group meeting for March was held as an open night in Antrim Estates Company in Glenarm Castle farm. The meeting was attended by 51 members who witnessed first hand how a local business has changed its marketing practices by changing from a continental beef suckler cow cattle back to a traditional breed of Shorthorn. The benchmarking figures suggested they were losing £125 per suckler cow, and after the transitional period they are now benchmarking figures around £525 per suckler cow. This is made up from reduced feed costs, and premium rewards for the Shorthorn Beef, which there is a huge demand for both here and mostly in London as a premium cut of beef. Adrian Morrow, Estate Manager, along with Brian Wilson, Farm Manager, hosted the members to a great display of very well run beef finishing system. This was followed by hot food and drinks in the Coast Road Inn afterwards. Within the group a number of farmers have been affected by delayed payments in their SFPs which is not ideal in the current agriculture climate. The UFU Technical team continue to chase these for members however the reason for some of the delays would have to remain questionable at times. We have just come through the wettest winter in living memory, extremely low commodity prices and ground conditions are making slurry spreading very difficult. The group hope that 2016 will see a change in fortunes with both commodity prices and weather. Health and Safety is becoming a major topic in our local area, and the group have been running some Health & Safety courses. These have been very popular and the farmers who have attended them have commented that it has been extremely worthwhile. Another set of eyes looking at how things operate on your farm can change attitudes to work in a safer environment which in turn should lead to less farm accidents. The group have another few days planned within 2016 and if any member wants to know more about these, or attend, please contact William or James in the office to discuss further.